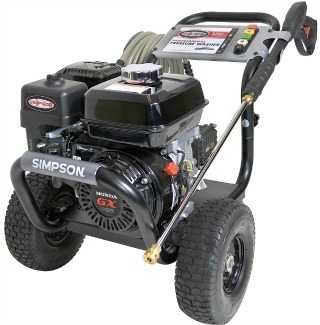 The Simpson PS3228-S Pressure Washer is an entry-level professional (or semi-pro) grade machine. It provides 3,200 PSI pressure and 2.8 GPM flow. 3,000 PSI is the minimum considered appropriate for professionals. This pressure washer might be for you if you have found that a consumer grade washer doesn't have enough power for you or doesn't hold up to heavy use. These machines are popular with contractors, extreme DIYers, and farmers or ranchers. In this review, we answer all your questions so you can determine if it is the right choice for your particular needs. This washer is very popular on Amazon. With 374 customer reviews, it has an average rating of 4.1 out of 5 stars, with 74% of the ratings being 4 stars or above (57% 5 stars). It ranks 19th in popularity among pressure washers (note that this category also includes electric power washers). Many reviewers are very happy with this washer and its capabilities. The main complaints are about the pump and Simpson customer service, which we will discuss further. The strongest feature of this washer is its engine. It is powered by a Honda GX 200 OHV Commercial Series engine. 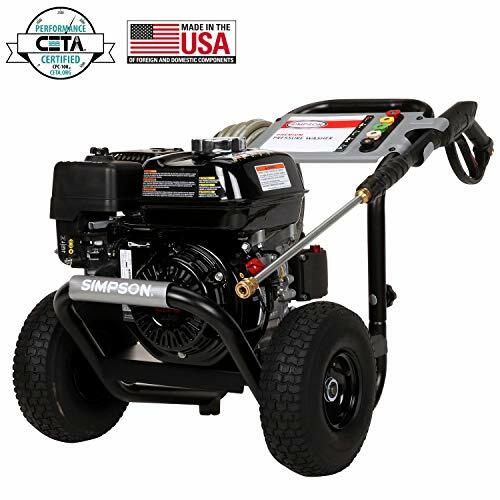 This is a 4-stroke, 196cc overhead valve engine that runs on high octane gasoline It provides 6 HP at 3500 RPM, which is more than enough power for general power washing. Honda engines are well-known for their reliability, fuel efficiency, and ease of use, and are the choice of professionals who use devices powered by 4-stroke engines. This engine model has a low oil alert system that will shut down the engine if the oil gets low. This is a nice feature, but really more of a marketing ploy than something useful. A responsible owner will check the engine oil on a regular basis, so unless there is a catastrophic failure of some part that causes a huge oil leak, the low oil alert system should almost never be triggered. This engine is extremely solid, made with high-quality materials including a cast iron cylinder sleeve, a rigid crankcase, and forged steel crankshaft. With proper maintenance, it should run for years. The engine is also compliant with emission regulations (both CARB and EPA), has a high compression ratio for fuel efficiency, and the precision camshaft design also contributes to the fuel efficiency. The steel fuel tank holds about one gallon of gas, which will run the washer for about 2 hours. The pump is the other critical component of a pressure washer. It provides the pressure and the flow, so it must be of high quality for the washer to perform well. There are three kinds of pumps used in pressure washers,: wobble, axial cam, and triplex. The triplex pump is the best, offering the most efficiency and longest life expectancy. The PS3228-S uses a 'AAA' (apparently a Simpson-owned brand) industrial triplex pump that features ceramic coated pistons and PowerBoost technology. The pump produces 3,200 PSI and 2.8 GPM. When it's working it is great. However, the reliability of the pump is the complaint most often made about this model of pressure washer. While the pump can be fairly easily replaced, it usually costs over $300, making it a significant portion of the cost of the washer. Dimensions: 34" x 20" x 25"
NOTE: Water intake hose not provided - a garden hose works fine. Care should be taken if using this washer on vehicles: standing too close or using too narrow a nozzle may remove the clear coat and/or paint. Cannot be run with hot water. Cannot be used with chlorine bleach, which will corrode the metal washer components. Cannot draw from a standing water source. Required a pressurized water source. Typical household pressure (20 PSI and 5 GPM) run through a garden hose (larger than 1/4") is adequate. In addition to complaints about the reliability of the pump, customers who bought online also reported difficulty obtaining warranty service for Simpson machines. Local shops were sometimes unwilling to provide service under the warranty, saying they have a hard time getting reimbursed by Simpson. There also seems to be some confusion between the warranty described on Amazon and the Simpson Website (Engine: 3 yrs; Pump: 5 yrs; Frame: 1 year; Accessories: 90 Days) and in the User Guide and Warranty provided by Simpson (Engine: 3 years (via Honda); Pump and Frame: 1 yr, Accessories: 90 days). Customers should probably assume the shorter warranty periods apply. Simpson customer service is considered poor by many commenters on Amazon. This being said, a large number of customers expressed great satisfaction with their Simpson power washers, and unhappy customers tend to comment more frequently than happy customers. While the washer comes with only a 25-foot hose, customers reported using a 50-foot, and even a 100-foot, hose without a loss of effectiveness. These can be used instead of the hose provided or attached as an extension with the proper fittings. The nozzles for this washer attach with threaded fittings, not quick-connect. While more time-consuming to change, threaded fittings are usually more secure. The wand that comes with the washer may be too short for individuals over 6 feet tall. Extension and telescoping wands can be purchased for less than $100 either online or at a local retailer. The washer comes with a pint of oil, which is enough to get started. The washers are all factory tested, so there is already oil in the system. A total of about 18 oz. of oil is required for the engine. Because of the factory testing, when unpacking the washer you may notice a gasoline or oil smell. This is normal. The water supply hose connection is on the side of the washer, while the pressure hose attaches at the rear. Users reported that this machine was easy to move on the pneumatic wheels. At 85 pounds it is comparatively light, although a ramp for loading and unloading is recommended. The wheels are 20" apart (from the centerline of the tires), so a 24" or wider ramp will work best. If storing in an area that goes below freezing, a pump antifreeze product must be used. For a busy do-it-yourself type, or a contractor, farmer, or rancher who needs to use a pressure washer on occasion, the Simpson PS3228-S is a great choice. The engine is first-rate, the pump is the best type (axial), and the frame is well-made. The price is comparable to other washers offering the same pressure and flow rate. It comes with everything needed to start using it right away, except for a garden hose for the water supply. There are many satisfied customers who say things like "Awesome tool", "Excellent machine for the money", "Well-designed and easy to move around", and "Best pressure washer we ever had".